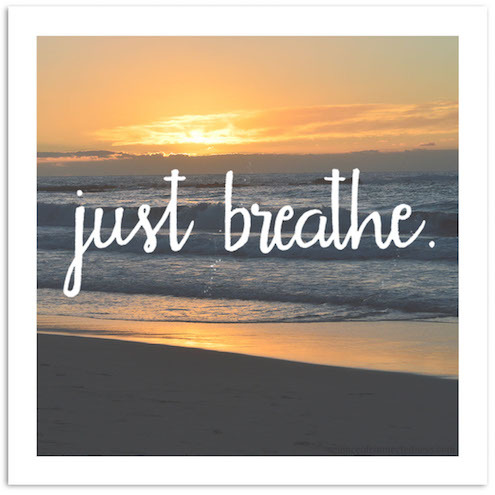 Breathing is directly tied to our existence (we need to breathe to stay alive), it is a simple tool (inhale, exhale, repeat), and it can be used anywhere (except underwater or in space without the right equipment 😉 ). Feeling nervous at the dentist? Breathe. Getting tired while exercising? Breathe. Feeling annoyed with your partner? Breathe. Wanting to savor a precious moment? Breathe. 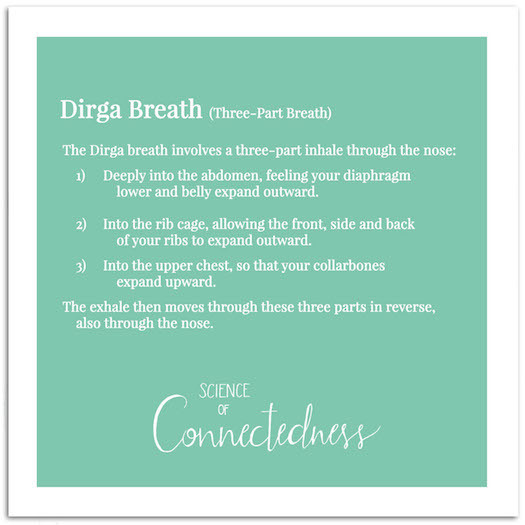 Conscious breathing, that is, breathing with purposefully relaxed awareness, is grounding; it brings you immediately to the present, and being present is essential for cultivating Connectedness (aka how I define spirituality). If your thoughts are always distracted by the what-ifs of the future or remembrance of the past, it is difficult—if not impossible—to also feel a connection with the present. Yet, the present is where those four relationships of Connectedness primarily reside. When you feel a connection to a community, it is not so much about your memories of the past or your hopes for the future; it is about feeling a connection in the presence of that community. Same with nature—it is about actually getting into a natural environment and noticing the Connectedness while you’re there. In order to notice, you need to be aware; in order to be aware, you need to be present; and in order to be present, one of the best tools is conscious breathing! Now, what exactly do I mean by consciously breathing? Well, our brains naturally control our breathing without us having to consciously regulate it (thank goodness). However, it is also possible to control our breathing, like when we choose to hold our breath or take a really big inhale or just generally think about ourselves breathing (I bet you’re noticing your breathing right now). When I say conscious breathing, I mean purposefully breathing in a relaxed way, with full awareness of each inhale and exhale. Your conscious mind is controlling the rate of your breath, but it is not forceful breathing nor should it feel strained; rather, it is breathing with awareness. [i] Hill, P. C., Pargament, K. I., Hood, R. R., McCullough, M. E., Swyers, J. P., Larson, D. B., & Zinnbauer, B. J. (2000). Conceptualizing religion and spirituality: Points of commonality, points of departure. Journal for the Theory of Social Behaviour, 30, 51-77. [ii] Sengupta, P. (2012). Health impacts of yoga and pranayama: A state-of-the-art review. International journal of preventive medicine, 3(7). [iii] Gerber, P. L., Goodies, L., and Brown, R. P. (2014).Mind-Body Practices and the Neuro-psychology of Wellbeing. In C. Kim-Prieto (Ed. ), Religion and Spirituality Across Cultures (pp. 227-246).